I always enjoy spending a few days in Sao Paulo, Brazil, but if you don’t know where to go it can seem like a massive concrete jungle that is tough to navigate. Fortunately that isn’t a problem for me since I’ve been several times and have good friends who are Paulistas. Cocktails in Sao Paulo taste sweeter from atop the SKYE bar. On our recent visit to Sao Paulo we met friends for cocktails at the SKYE Bar atop Sao Paulo’s Unique Hotel. 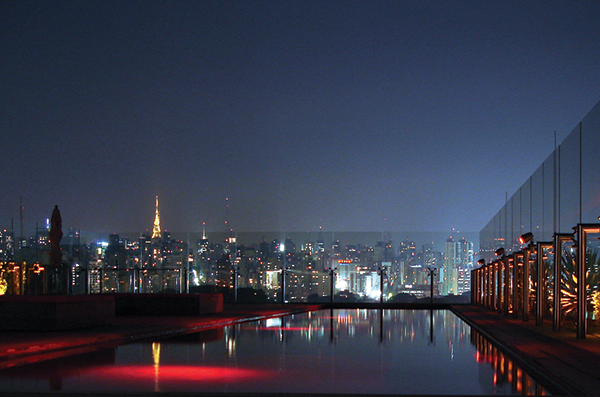 Located near Ibirapuera Park, the roofdeck bar offers some pretty spectacular views of the city’s skyline (see above). When you drive up to Unique Hotel you realize the name is accurate – regardless of what you make of the architecture – which I loved by the way. Our taxi driver referred to it as “melancia” (watermelon), which made me laugh. The bar is sleek and designed to impress from the minute you enter through the marble hallway and walk through the dining room. Red lights reflect off the lap pool that runs the length of the deck beside comfortable furniture that is available on a first come first serve basis. 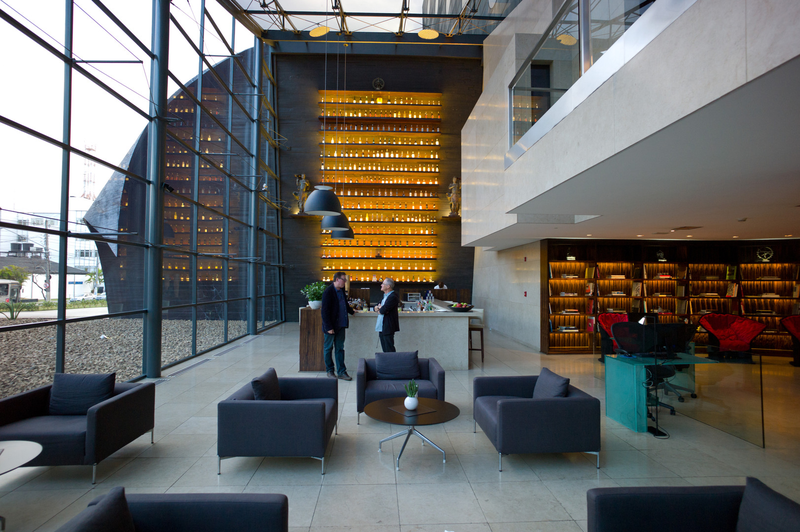 If for some reason, the weather is not cooperating but you would like to visit the hotel, they have an impressive second option in the hotel lobby on the ground level worth checking out. You can grab a seat at their large bar or sit down in their library which has plush red seats and can be seen in the image below to the right. Regardless of the weather, this is a great place I would recommend for cocktails. 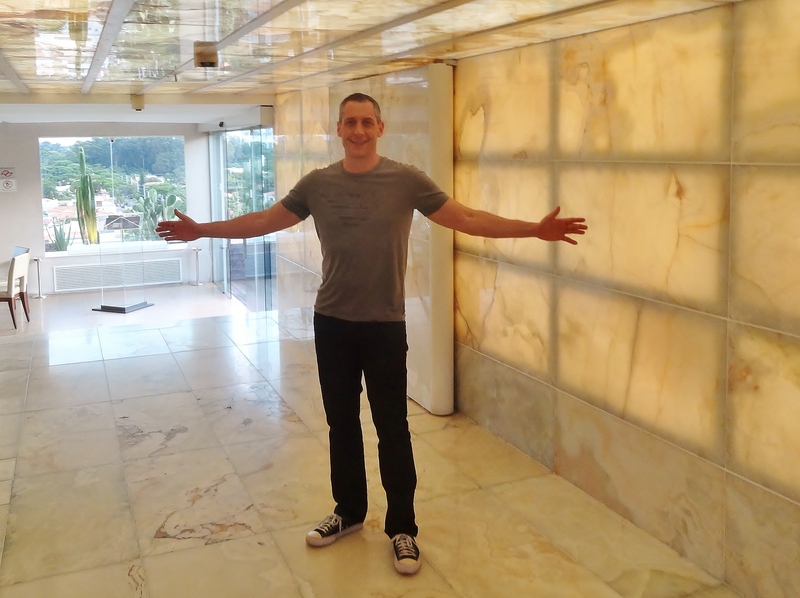 This entry was posted in Brasil, Brazil, Cocktails, Travel and tagged BosGuy, Boston Guy, cocktails, Travel. Bookmark the permalink. 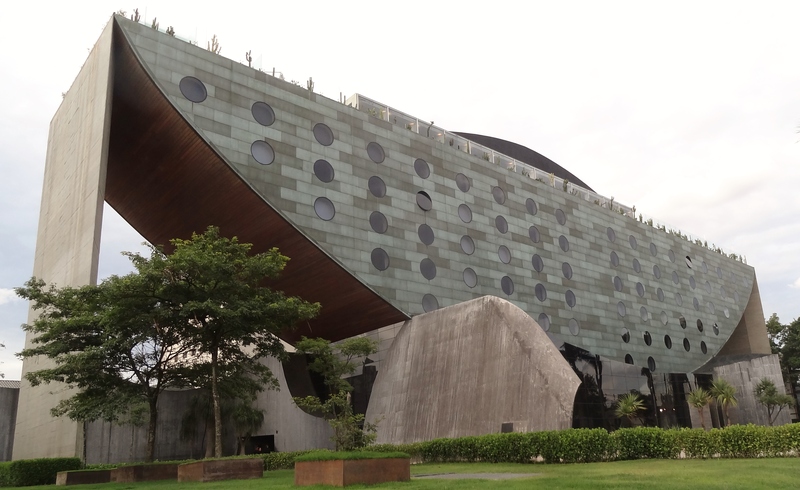 Visited the Hotel Unique and SKYE Bar in Sao Paulo in May ’14. Awesome place!